Vocabulary and oral language development is the foundation of later literacy skills, such as reading and writing. Research shows that exposing children to unfamiliar words in conversation has a positive impact on vocabulary development; and using complex, or “spicy,” words with young children benefits their reading comprehension into the fourth grade! Fortunately, the best way to support vocabulary and oral language development is simply to talk to and read with your child every day. Hold eye contact as you talk with your baby. This helps establish an understanding of the norms of communication. Use gestures as you are talking to your infant. For example, tap your lips with your fingers when you say. “Eat.” You can tell your baby, “It’s time to eat. We are going to eat a banana.” Whenever you say “eat,” repeat the motion. With consistency, your child will be able to use these gestures to talk to you. As your baby chats to you, listen and repeat their babbles. Allow time for them to respond. This is the start of oral language and will show the flow and form of a conversation. Read your child’s favorite books and sing their favorite songs repeatedly. Encourage them to tell parts of the stories and sing the songs with you. When you are talking to your child about something, point to it. Similarly, if your child points to something, point to it and tell them what it is. As you read to your child, ask them questions about what’s happening in the story and how they feel about it. This will help them to practice listening, retelling, and verbalizing thoughts. Ask questions that require your child to talk about the events of the story sequentially. As your child speaks to you, listen and ask questions. The best questions are open-ended, meaning that they don’t have a right or wrong answer. Allow time for them to respond. In addition to asking follow-up questions, ask your child to explain what they’ve just said or to give more detail. Have frequent conversations with your child about things of interest to them. Use spicy, unfamiliar words and talk about what those words mean. Encourage your child to make comparisons of objects or events using descriptive words. For example, if you have two different leaves, ask your child how they are the same and how they are different. Have your child tell a story about something they recently experienced. Ask them what happened first, next, and last. Encourage them to tell the story sequentially. When shopping, talk with your child about what you need and plan to buy. Encourage them to describe the items using precise words. Have them practice giving directions by explaining how to reach the item as you walk through the store. 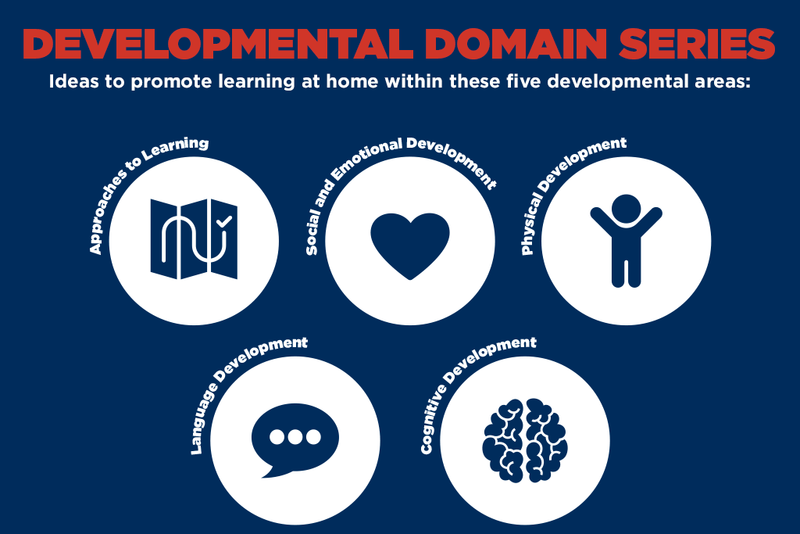 Next month, we’ll focus on the literacy development portion of Language Development Domain.